There was a roller coaster of emotions experienced on the final day of the Seamaster 2018 Hang Seng Hong Kong Open as proceedings at the Queen Elizabeth Stadium drew to a dramatic close. Recap all the action from the final day of play with our day four review. 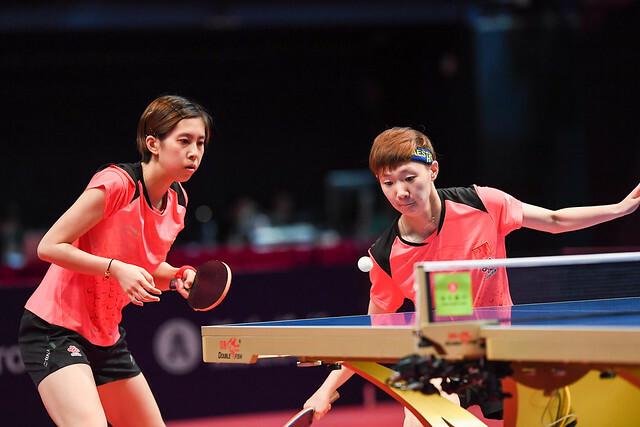 The day began with an all-Chinese battle for the Women’s Doubles crown as Chen Xingtong and Sun Yingsha met Wang Manyu and Chen Ke in the final. In the previous fixture between the two pairings in Qatar it was Wang Manyu and Chen Ke who emerged victorious but Chen Xingtong and Sun Yingsha avenged that defeat in Hong Kong with a straight games win (11-9, 11-8, 11-9) to secure the first gold medal of the afternoon. Revenge in the Women’s Doubles contest and the same story unfolded in the Men’s Doubles final: losing out to Masataka Morizono and Yuya Oshima in agonising fashion at the Seamaster 2017 ITTF World Tour Grand Finals but this time around the local partnership of Ho Kwan Kit and Wong Chun Ting got the upper hand over the Japanese duo with a powerful effort (11-6, 11-2, 11-9), claiming their second title as a pairing on the ITTF World Tour. Wang Manyu dampened Chen Xingtong’s 21st birthday celebrations in the penultimate match of the tournament to lift the Women’s Singles trophy. Women’s Doubles success earlier in the day but Chen Xingtong missed out on a second title in Hong Kong with Wang Manyu prevailing across six games (12-10, 11-8, 3-11, 11-6, 4-11, 11-9) to claim her third gold medal in the category. Rather astonishingly Chen Xingtong wasn’t the only player to experience a birthday defeat on the final day of play with Cho Seungmin also suffering the same fate in the Men’s Singles title match. On what was his 20th birthday Korea Republic’s Cho Seungmin entered the final with plenty of confidence having beaten Japan’s Maharu Yoshimura in the last four, however, he couldn’t replicate that outcome against Maharu’s younger brother Kazuhiro Yoshimura who went on to reach the top step of the podium for the first time (11-5, 5-11, 11-8, 11-3, 11-7).